Medical marijuana has recently been legalized in more than 30 states and in the District of Columbia and Puerto Rico. Naturally, there has been an increased interest and a high demand for answers. We hear a lot of people ask questions like: Is it really safe? Does it kill brain cells? What are the long-term effects? Does it make you high? Over the years, it hasn’t been easy to find the answers to these questions due to the fact that marijuana is still illegal at the federal level. The Drug Enforcement Administration (DEA) classifies marijuana as a Schedule 1 drug (like heroin and LSD) which requires a special license for researchers to study the drug. Although the drug classification hasn’t changed, the DEA has recently agreed to support more research and loosen restrictions on researchers. So, what is known? What’s a Myth and what’s a fact? MYTH: Medical marijuana is only used for serious illnesses like cancer. False. Cannabis can treat various illnesses and ailments including anxiety, migraines, arthritis, chronic pain, PTSD, IBS, fibromyalgia and epilepsy. Medical marijuana has also been used to stimulate appetite and weight gain in people with eating disorders, cancer and AIDS. To see a full list of conditions that are eligible for medical marijuana, visit our Medical marijuana & Cannabis page. MYTH: Marijuana is just as harmful as cigarettes. False. Even though cigarettes and medical marijuana contains some of the same ingredients, marijuana is not as harmful as cigarettes. The harmful effects of smoking cigarettes are well established and include significant lung damage, chronic pulmonary obstructive pulmonary disease and lung cancer. The more you smoke, the more lung function you can lose. However, the same does not hold true for marijuana. In a study from the University of California, researchers actually found that the flow of air into the lungs increased rather than decreased with the increased exposure to marijuana up to a certain point. Researchers believe that this is most likely due to the difference in the amount of each substance that is smoked. On average, nicotine users may smoke 10 to 20 cigarettes a day where marijuana users only smoke two to three times a month on average. While heavy marijuana use did show harmful effects on the lungs, marijuana used for medical reasons is usually not heavy. Also, there are other ways to use medical marijuana besides smoking such as taking capsules, vaping and edibles. MYTH: Medical Marijuana is addicting. False (kind of). While it is possible to become dependent on marijuana, it is very uncommon. Research shows that only about 9% of all marijuana users become addicted. Seemingly, the percentage is even lower among medical users since they are not heavy users. It is important to note that some people have a higher risk for addiction to any drug than others, including alcohol. These risks can often include a family history of addiction, high stress levels and even having friends and family who use drugs. MYTH: Children are not eligible for medical marijuana. False. In some states, cannabis for children with certain qualifying conditions, including cerebral palsy, cystic fibrosis, epilepsy, severe autism and terminal illness requiring end-of-life care, is approved. Last year, the Food and Drug Administration approved Epidiolex, the first pharmaceutical-grade CBD drug, to treat severe and rare forms of epilepsy in children aged two or older. In Florida, if a patient is under 18 years of age, they must have two physicians assess and diagnose the patient with the qualifying medical condition. It is important to note that Pensacola Wellness Solutions requires that all patients are over the age of 18. See Pensacola Wellness Solutions’ qualifications here. MYTH: Medical marijuana kills brain cells. False. In a 2015 study published in the Journal of Neuroscience, researchers at the University of Colorado at Boulder and the University of Louisville looked at the four areas of the brain in daily marijuana users and compared them to nonusers. Their results showed that there were no statistically significant differences in volume or shape between the two groups. MYTH: Medical marijuana makes you high. Here’s the deal: some do, some don’t. Marijuana has more than 100 active components with the two main chemicals being THC and CBD. The THC is what produces the “high”, but CBD does not. Patients who use CBD-dominant strains of marijuana tend to not feel a change in their consciousness. Also, medical marijuana generally contains more CBD than recreational marijuana. It’s important to note that in Florida, there are two options: low-THC cannabis and medical marijuana. Low-THC cannabis contains 0.8 percent or less of THC. Low-THC cannabis is most commonly used and does not usually produce the “high” commonly associated with cannabis. 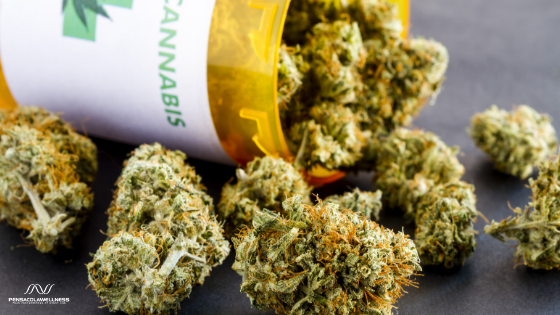 If you have more questions about medical marijuana and how to qualify as a patient, head over to our Medical Marijuana & Cannabis page or give us a call at 850-791-6010.